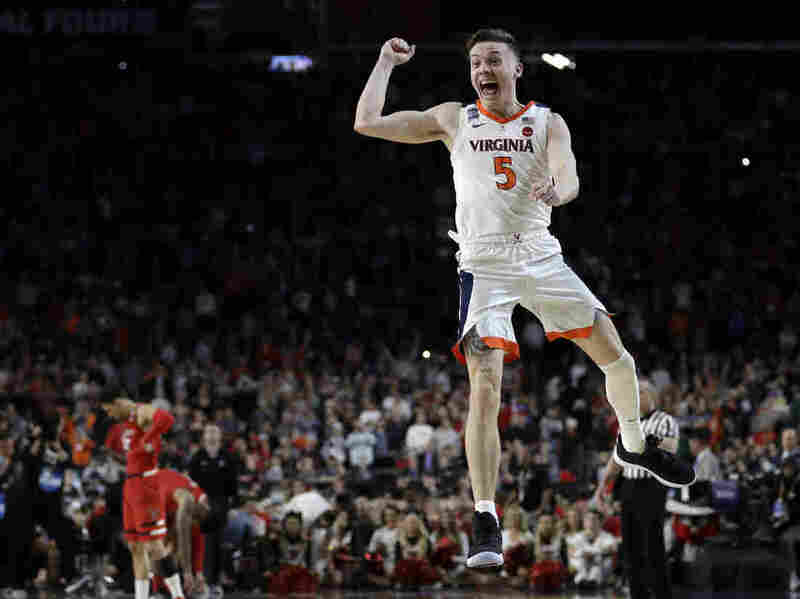 'This Is A Great Story', Says Virginia Cavaliers' Coach On Team's NCAA Comeback Monday night in Minneapolis, the University of Virginia won its first-ever NCAA championship in a dramatic 85-77 overtime defeat of Texas Tech University. Virginia's Kyle Guy celebrates after helping his team defeat Texas Tech in the NCAA championship tournament. The title game finished in overtime – a first since the University of Kansas beat the University of Memphis in 2008. It was a big comeback after last year's tournament, when the University of Virginia team lost to University of Maryland, Baltimore County in an early round – the first time a No. 16 had ever beat a No. 1 seed team. As the overtime clock hit 0:00, Virginia player De'Andre Hunter – who scored a career-high 27 points – threw the basketball into the air in celebration. Confetti rained down, then the winning team cut down the basketball net, fulfilling an NCAA championship tradition. The road to this moment was rocky for both teams. Virginia had close calls against Purdue and Auburn, and Texas Tech made it to the playoffs after losing their first conference tournament game. But both teams showed up in full force on Monday night. So did their fans. Notable alumni from both schools came out to support their teams, including NFL quarterback and Texas Tech University alumni Patrick Mahomes, and University of Virginia-grad Katie Couric, AP reported. At one point, a fan threw a tortilla – a Texas Tech school tradition – that landed on the elevated court, causing play to stop temporarily. It was an evening of a few other "firsts." Both teams made their NCAA championship debuts, and the University of Virginia won it's first-ever national title at the tournament. The last time the NCAA had a first-time champion was thirteen years ago when the University of Florida bested UCLA in 2006. And a block from Virginia sent the championship game into overtime for the first time since the University of Kansas beat the University of Memphis in 2008, according to NCAA.com. The teams also matched a previous record – 21 combined 3-pointers in a championship game, The Associated Press reported. At the end of the night, the NCAA announced the Final Four's all-tournament team; three spots went to Virginia players – De'Andre Hunter, Ty Jerome and Kyle Guy, who was voted 'Most Outstanding Player' after scoring 24 points in the title game. Jarrett Culver and Matt Mooney of Texas Tech also made the list.